Helen Gym of Asian Americans United told the crowd, “Citizenship is not a piece of paper. It is in our hearts, hands, backs and dreams. We demand a place at the table!” She went on to relate the story of Mrs. Jiang Zhen Xing, a mother of two who had resided in the city for 11 years and was pregnant with twins. 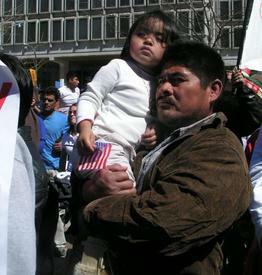 When Mrs. Jiang reported to the local immigration office as instructed she was taken into custody on the spot, separated from her children and husband and driven to New York’s JFK airport for immediate deportation. Despite her protests and appeals, she was denied medical care and left without attention for hours. She was finally taken to a hospital where it was discovered she had miscarried her unborn twins. The case has caused widespread outrage in the Chinese community and across the city.